It’s fair to say the Xperia Z3 is only a minor upgrade to the only recently released Z2. In terms of camera specification both are very similar, featuring a 20.7Mp rear camera, together with a 2.2Mp front camera and 1080p video capture for those all-important selfies. 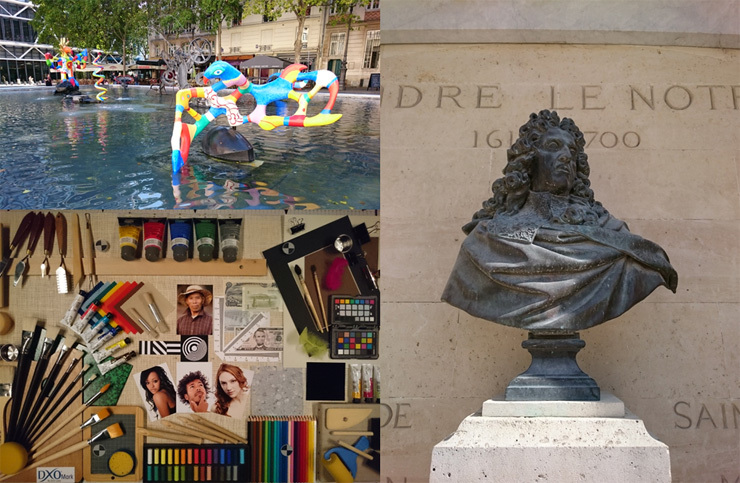 What is new on the Xperia Z3 is an improvement in its low-light capabilities, thanks to a new maximum ISO of 12800. 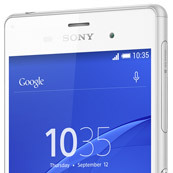 The new Sony Xperia Z3 is smaller too, but only just, with body dimensions of 146 x 72 x 7.3mm for the new device, compared to 146.8 x 73.3 x 8.2mm for the Z2. They also share the same 5.2in 1920x1080px screen and both run the latest version of the Google Android operating system – 4.4 KitKat. The new Xperia Z3 does boast an upgrade to its processing power however, thanks to a 2.4GHz Qualcomm Quad-core CPU compared to the Z2’s 2.3 GHz chip set. Sony’s battery life stats suggest the two devices are quite similar in this regard also, although the new Xperia Z3’s battery capacity is a slightly smaller 3100mAh, compared to 3200mAh on the Z2. With an overall DxOMark Mobile Score of 79 the new Sony Xperia Z3 currently ranks in joint 1st place alongside the Samsung Galaxy S5 and Sony’s own Xperia Z2, also with 79 points. 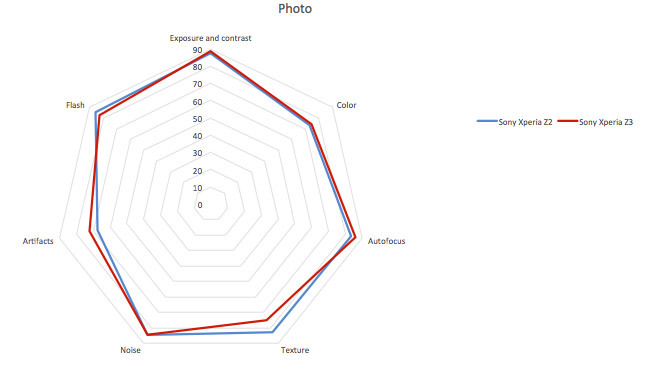 For picture quality the Sony Xperia Z3 also ranks joint top for stills with a DxOMark Mobile Photo score of 81, the same as both the Sony Xperia Z2 and Nokia 808 PureView. 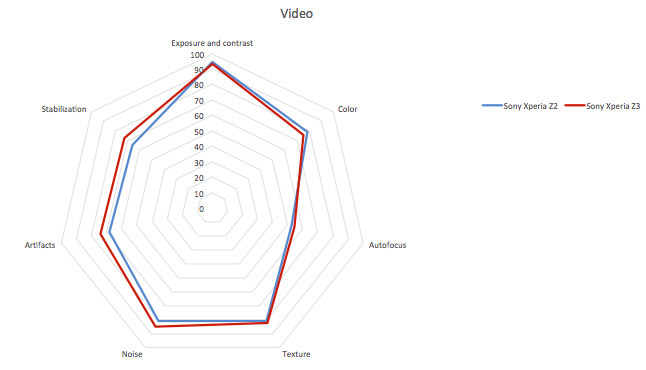 Those dizzying heights can’t quite be matched with its video performance however, where the Xperia Z3 slips into a still very respectable 2nd place on our database, with a DxOMark Mobile Video Score of 76, just 3 points off the class-leading Samsung Galaxy S5 with 79 points. The Z3’s video scores are again excellent for Exposure and Contrast and the addition of Sony’s SteadyShot system for video bolsters its Stabilisation score, too. 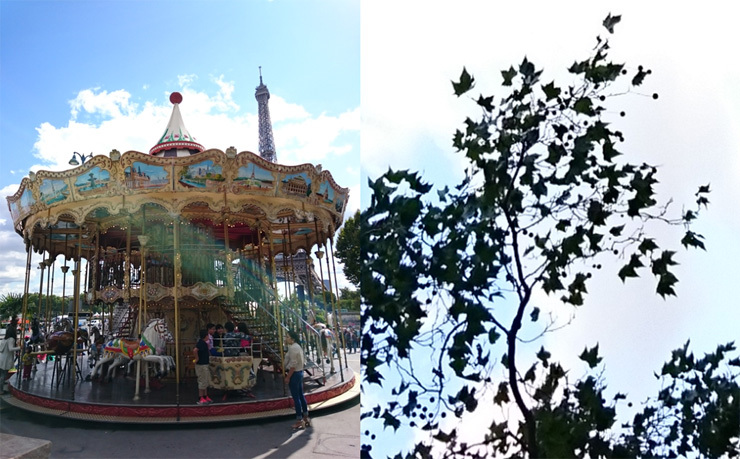 With Exposure and Contrast one of the Sony Xperia Z3’s strongest areas you can expect good overall exposures, as well as pleasant and vivid colors shooting in most environments. Some pink color shading in the corners was visible on a few outdoor shots, as well as when shooting under low light. 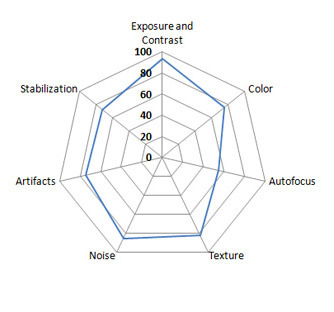 Noise is very well controlled in all lighting conditions however, with no chroma noise discernable and only minor noise levels evident in the luminance channel. Good detail is also preserved too, although there is a slight loss of detail noticeable compared to the Xperia Z2, and ringing is typically higher than is evident on most high-end Smart Phones, too. Some fairly strong lens flare is evident when shooting sunny backlit scenes, which is something to watch out for, but the Sony Xperia Z3 handles chromatic aberration well, with no noticeable color fringing evident along high contrast edges. 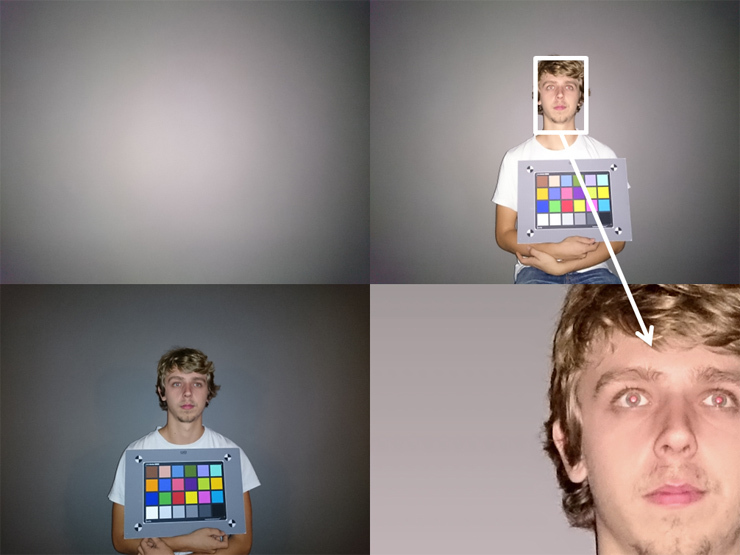 For flash pictures, exposure and white balance remain good, with high levels of detail preservation, but on the downside some color shading is noticeable when mixing flash with tungsten light sources. In low light under tungsten light WB turns yellow but the colors remain pleasant (bottom left). In good light colours are vivid although pink corner shading is noticeable in some images (right). Despite good sky exposure on many shots (left), the centre image displays a colour gradient in the sky and strong flare. With indoor lighting some colour shading is visible too (right). At 100% crop (right) noise is barely noticeable in the sky, but a lot of good detail has been retained in the image overall. Some fairly prominent lens flare is noticeable when shooting sunny backlit scenes (left) although no noticeable fringing occurs along high contrast edges (right). With the Sony Xperia Z3 hitting the shelves only months after the Z2 was launched is now the right time to pick up a Z2 a little cheaper? In terms of their camera performance and image quality, that would indeed seem a wise move as both the Z2 and Z3 models sit joint top of the DxOMark Mobile rankings with 79 points, alongside the Samsung Galaxy S5. For stills the performance of the two Sony Xperia handsets are very similar, again top with a joint score of 81, which is no surprise as the camera and specs are very similar. The extra sensitivity, up to 12800 on the Z3, could come in handy if you shoot a lot in low light conditions, although the DxOMark Photo Noise Score for both models is consistent at 84. 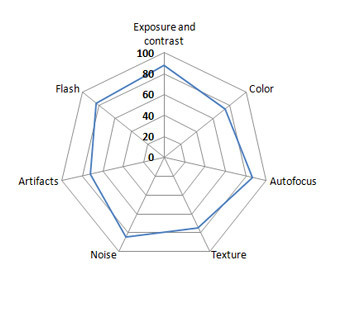 With a joint DxOMark Photo Score of 81 overall stills performance from the 2 models is very similar, although the new Z3 is better for artefacts with the Z2 offering improved texture. If video is important on your Smart Phone however the addition of Sony’s SteadyShot system on the new Xperia Z3 gives it the edge over its predecessor. 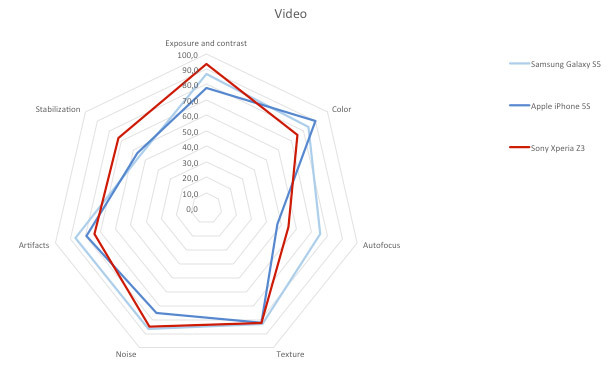 The new Z3 also outperformed the older model for video artefacts and noise, to give it an overall DxOMark Video Score of 76, compared to 73 for the Xperia Z2. So how does the new Sony Xperia Z3 shape up against the other flagship Smart Phones from the leading players in the industry, Apple & Samsung? Overall Samsung’s Galaxy S5 and the Sony Xperia Z3 just nudge out Apple’s iPhone 5s with a joint top DxOMark Score of 79, compared to 76 for Apple’s device. 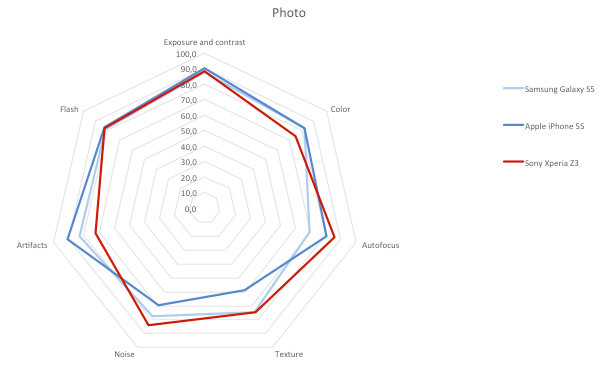 If stills photos are your primary concern however, the Xperia Z3 steals the spoils with the highest DxOMark Photo Score of the 3 devices, 81 compared to 79 for the GS5 and 78 for the iPhone 5S. 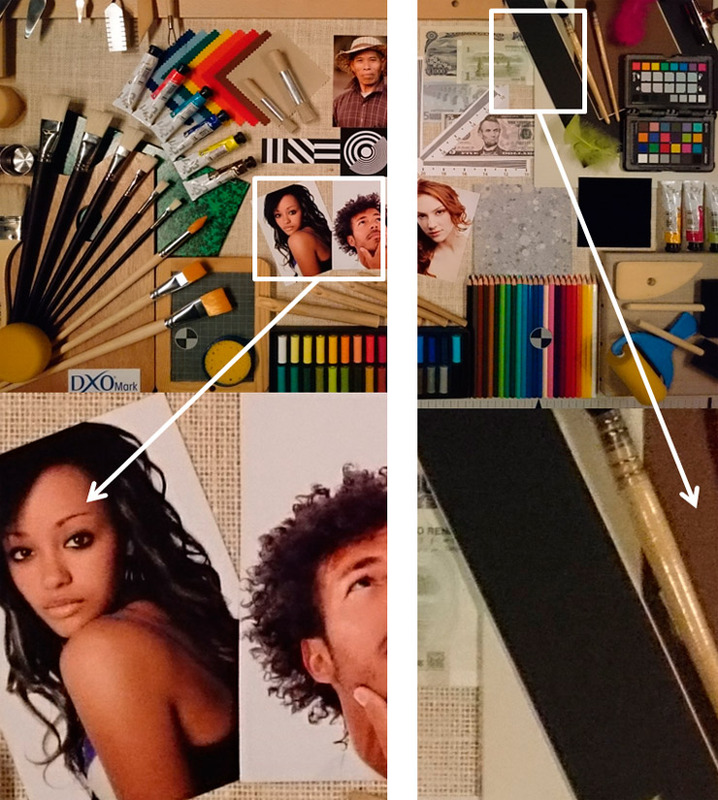 Whilst flash, as well as exposure and contrast, results are almost identical between these 3 Smart Phones, the Xperia Z3 just nudges out the others out for autofocus, texture and noise, and although marginally worse for artefacts & color, that’s enough to give it the edge in terms of the DxOMark Mobile Photo Score. The new Z3 just tops the table for stills photo results compared to the Samsung Galaxy S5 and Apple iPhone 5S, although to be fair there’s not much in it. For video the Sony Xperia Z2’s score of 76 sandwiches it between the class leading Samsung Galaxy S5 on 79 points and Apple’s iPhone 5s with 72. Whilst the Galaxy S5 steals the show in most video categories, the Z3 does excel for video stabilsation, thanks to that SteadyShot system, as well as exposure and contrast. Video on the Z3 is let down by its autofocus performance however, which is only slightly better than the iPhone 5s. Video Scores on the Xperia Z3 aren’t quite as impressive as its Photo Scores dropping it into second place behind Samsung’s Galaxy S5 for video.